One of NASA’s premier wind tunnels at the Langley Research Center is broken. 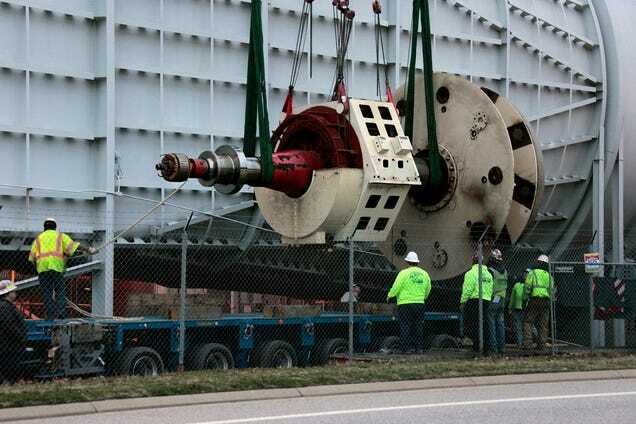 The motor, which drives the tunnel’s wooden blades, experienced an electrical short. 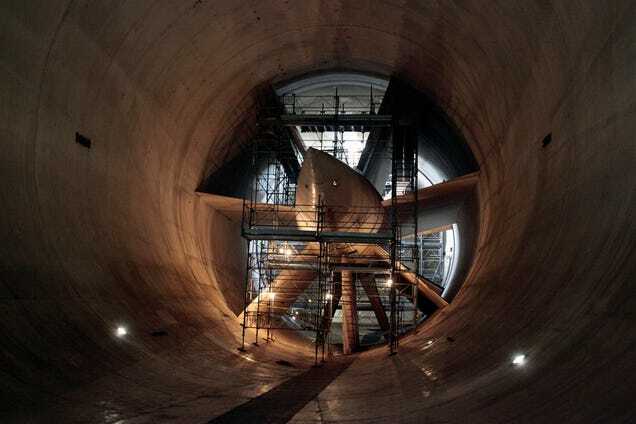 So how do you repair a massive ageing subsonic wind tunnel? For those of us who love observing huge structures and machines being dismantled and put back together again, NASA just published a nice set of images explaining the process. 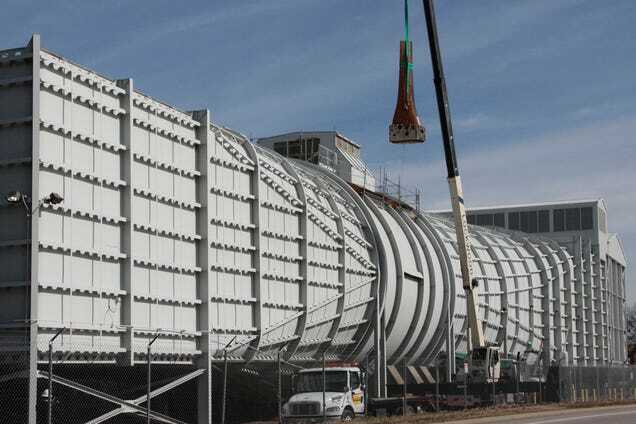 NASA Langley Research Center’s 14-by 22-Foot Subsonic Wind Tunnel is an atmospheric, closed-return tunnel where the airflow can reach a velocity of 237 mph. 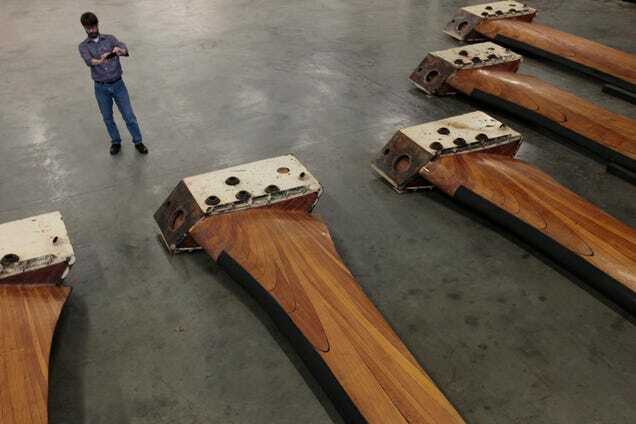 The artificial wind is produced by a 40-ft diameter, 9-blade fan, which 16-foot long blades were made of wood. The tunnel has a fully closed rectangular test section with slotted walls, and an open test section closed only on the floor. Back in the 50s, NACA, NASA’s predecessor, started conducting exploratory research on radical new vertical take-off and landing (VTOL) aircraft, and for wind tunnel tests they needed relatively large test sections compared to the model size. Early VTOL tunnel testing took place in the Full Scale Tunnel and the modified 7X10-Foot Tunnel, but the results weren’t satisfying, so a proposal was made for a more capable new wind tunnel specifically designed for vertical and short take-off and landing configurations. The construction began in 1968 on the place of the demolished 7X10-Foot Tunnel. The new tunnel, named “Langley V/STOL Tunnel,” began operating in 1970. The 12,000 horsepower drive motor is now being shipped off for repairs. The tunnel is expected to be up and running again this fall, after the motor is fixed, returned, reinstalled and tested. After that more low-speed tests for high-lift stability and control, aerodynamic performance, rotorcraft acoustics, turboprop performance, and basic wake and airflow surveys are to come for NASA, industry, DoD, and academia including aircraft, rotorcraft, structures, and ground vehicles. The engine of the 14x22 subsonic wind tunnel during the recent repair. 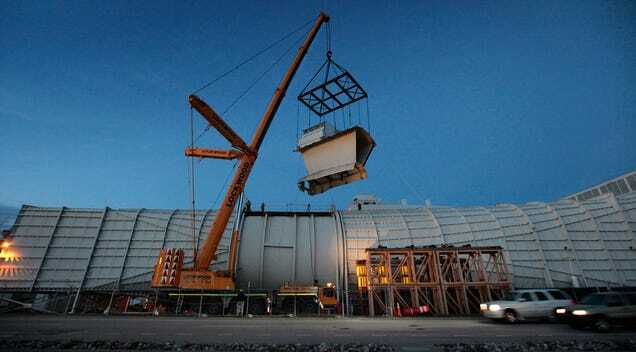 Huge crane lifting off the top of the tunnel to gain access. The drive motor being lift out of the wind tunnel. The blades of the disassembled fan. Close up photo of a blade.